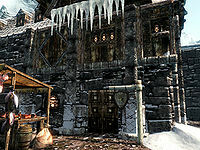 The White Phial is the alchemical shop located on the north side of Windhelm's market district. The owner is Nurelion, who named the shop after the legendary artifact he's spent many years searching for. When Nurelion is not available, the shop duties are handled by his assistant, Quintus Navale. When entering the shop the counter is in front of you down the length of the room with an end piece to the right and stairs up to the residence against the east wall. 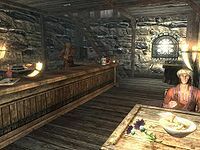 There is a square table and two chairs to the left, against the south wall, while in the southeastern corner is an alchemy lab. There are displayed merchandise on the counter, under the counter, on the square table to the left, on the two sets of shelves and another square table behind the counter, against the north wall. There are additionally several sacks and barrels containing foodstuffs throughout the shop and residence. In addition to these items there is a bottle of alto wine and a mammoth cheese bowl on the counter, a copy of the Illusion skill book The Black Arts On Trial, an iron dagger and sword under the counter, three iron ingots on the table against the north wall, with an empty lesser soul gem on a stand beside it and a tomato on one of the shelves. To the west is a doorway into a storeroom, which is also used by Quintus Navale as a bedroom. It is filled with crates, sacks, barrels, a cart filled with floor rugs and in the middle of the room a single bed with an iron shield by the foot of it and a basket containing a gourd and two potatoes by the head. At the top of the stairs is a dining and kitchen area with a long wooden table and benches in the center of the room, with a haunch of raw venison, a portion of grilled leeks, a sweet roll and a red apple on the table and an apple pie under it. The floorboards on this level have several holes in them. In the southeastern corner is a cooking pot on a stand with two racks hanging from a beam to the left, holding two rabbits, two pheasants, two garlic braids and a bunch of dried frost mirriam. In an alcove on the south wall is a set of shelves holding two bottles of wine among loads of clutter, with a chair to the right of it. Further along the south wall is an end table with a master locked strongbox on top and a tall wardrobe containing clothes to the right. There is a doorway on the west wall, with another set of shelves to the left of it holding a gourd and more clutter. 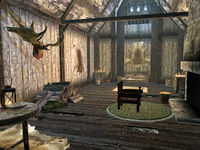 The doorway leads into Nurelion's bedroom, which contains an owned double bed coming out from the west wall, with an end table to the left, against the south wall with a bottle of Nord mead on top and a lute beside it. While to the right of the bed, against the north wall is a dresser with the business ledger, a bottle of Nord mead and a copy of Harvesting Frostbite Spider Venom all on top. To the right of the dresser, in the middle of the north wall, is an unlit fireplace with a drum to the left, a cauldron to the right and a chair in front of it. Finally in the southeastern corner is a round wooden table and chair. This is the merchandise found in the White Phial's merchant chest. These items are only available if purchased from the merchant; they cannot be pickpocketed or stolen. They are restocked every two days. Nurelion can still be heard yelling at you for loitering in his store even when no interaction with him is possible. There is a Loot shadowmark to the right of the store's sign.